Do you have a Holiday Home you wish to rent out? POSSIBLY THE best approach to Simat de Valldigna is on the road from Barx. As the road begins to wend downwards, you see a picnic spot and photo opportunity to the left, where you can look down on the vast fertile plain of Valldigna, laid out below like a decorated green quilt with the roof tile red and bright wall white of Simat, Benifairro and Tavernes, and the magnificent Monastario de Santa Maria de Valldigna as its majestic centrepiece. As you enter Simat, follow the one-way sign into the village and, just as you reach the end of the street, you will see the grand twin towers of the Monestario to the right. 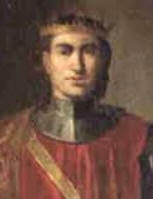 Legend has it that Jaime II passed through the valley then known as Alfandec, on his way from waging war against the Moors in Alicante and Murcia. 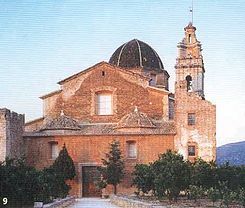 He was impressed by the beauty and fertility of the area and said to his chaplain, Friar Bononat de Vila-Seca, Abbot of the Cistercian monastery of Santes Creus: "Vall digna per un monestir de la vostra religio (a valley worthy of a monastery of your religion)", to which the abbot replied "iVall dignal! (a worthy valley indeed!"). 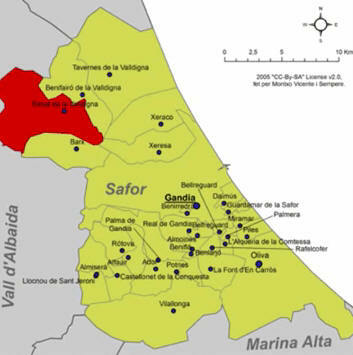 In March 1298, the land was given to the abbot for the foundation of a new Cistercian order and the valley has been known ever since as Valldigna. The monastery shows three different stages of construction - the original 14th Century Gothic, renovations undertaken after serious damage was caused by an earthquake in 1396 and a second major renovation in the Baroque style after another earthquake in 1644. In 1835, with the expropriation of church lands, the monks were expelled and the monastery sold into private hands. Many of the buildings were destroyed and the great stone blocks sold for construction. This splendid physical prayer to the glory of God fell into ruin. 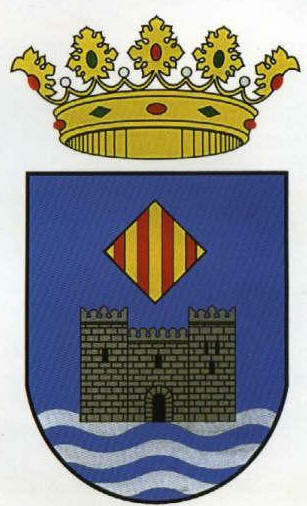 In 1991, the Valencian government began a massive restoration project, spurred on by the 700th anniversary of its foundation. The monastery will never again be seen in its former glory but it is a delight to behold nonetheless. The Iglesia de Santa Maria is stunning. Sacked of its alters and artworks, the bare walls at first seem pitiful in their nakedness, but look heavenward as you pass through the enormous brass covered doors and you see a ceiling of such ornate plaster and paintwork that it makes you gasp. In its former glory it must have been absolutely breathtaking, but even now, awaiting the restorer's caring hands, it is one of the gems of the artistic heritage of the Valencian Community. 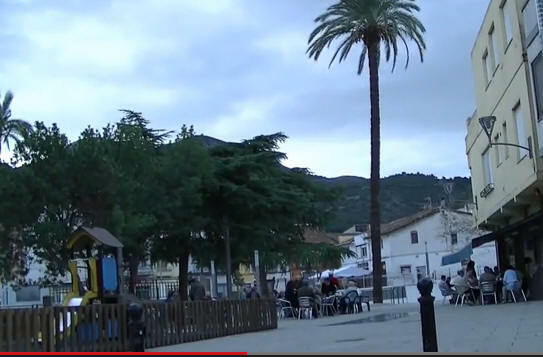 Other than the Monastario, Simat is a rather unpretentious little town - for 'unpretentious' read 'unremarkable', although the young lady in the casa bel Poble, the Ayuntamiento, obviously wouldn't agree with me. She is from Simat 'and very proud' - Lord knows why - and insisted on turning every page of the leaflets she gave me, pointing out the most interesting places in the town. It didn't take very long! 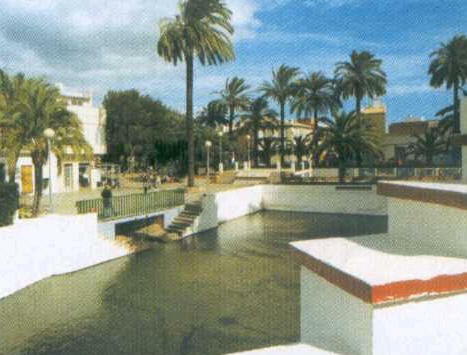 Much of the village gathering takes place around the Font Gran, a big pool so shallow that you wonder how the fish don't scrape their stomachs as they lazily drift around. An enormous conifer at the side of 'El Gran' provides shade in the summer and protection against winter drizzles for groups of men yarning away over football and other tedious narratives of small town existence. Meanwhile, the ladies are probably having a far better time chatting over a cuppa somewhere. Simat de Valldigna is worth the visit though, even if it's just for the Monastario, especially if you go when they have one of their concerts or exhibitions on English guides can be arranged by appointment. 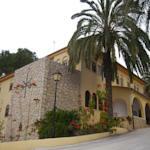 Holiday Lets that are available at nearby Gandia are listed below. Each bright spacious room at the Bayren offers a private terrace and attractive modern décor. Most have either a front, or side sea view. Each room has a flat-screen TV, a minibar and a safety deposit box. 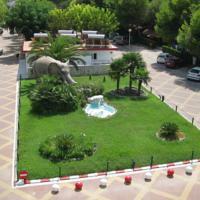 The Mare Nostrum Restaurant offers buffet cuisine with Valencian and international dishes. It has a terrace overlooking the sea. Guests can later enjoy a drink in the beach-front chillout bar. The spa area features an indoor pool, flotation tanks, Scottish shower and steam baths. There is also a sauna and a treatment room. Outside there is a second pool, as well as a hot tub and water beds with sea views. 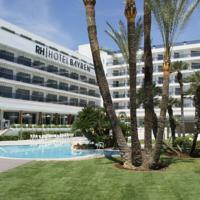 The RH Bayren Hotel & Spa offers a daily entertainment programme and has a children’s club. The wooden bungalows at l’Alaqueria feture simple décor. Each one has a bathroom and a kitchenette with a hob, fridge and coffee-maker. The campsite's outdoor pool is open from June to September, and the indoor pool from October to May. The property also has a hot tub and a sauna. Other facilities at Camping l'Alqueria include a football pitch and a games room with a table tennis table and arcade games. There is also a children’s entertainment programme during the summer. L’Alqueria has a café-bar serving drinks and international food throughout the day. 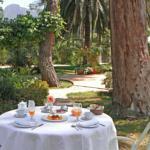 There is also an on-site supermarket and barbecue facilities. L’Albufera Nature Reserve is 30 minutes’ drive away. You can drive to Valencia Airport in around 50 minutes. Free Wi-Fi is provided. 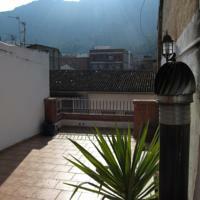 Holiday Lets that are available at nearby Gandia are listed ABOVE use the Scroll Bar to see extra properties.